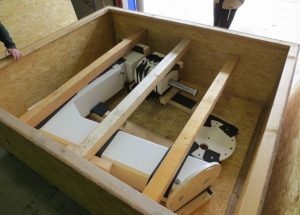 The telescope mounts from APM have finally been delivered after a four month sea voyage from Germany. 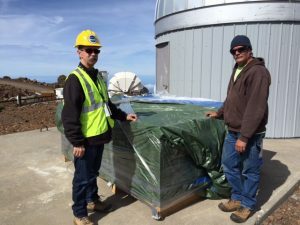 The first one on Haleakala will carry the first ATLAS telescope, and the second one on Mauna Loa will carry our faithful Pathfinder for a few months until the second ATLAS telescope is shipped. The APM mount #2 arrived safely in Hawaii and is in Hilo, awaiting delivery to Mauna Loa. APM mount #1 was successfully delivered to Haleakala on Monday, thanks to the fantastic IFA staff.